← Mobile Phone Base Station Tower Settings Adjacent to School Buildings: Impact on Students’ Cognitive Health. 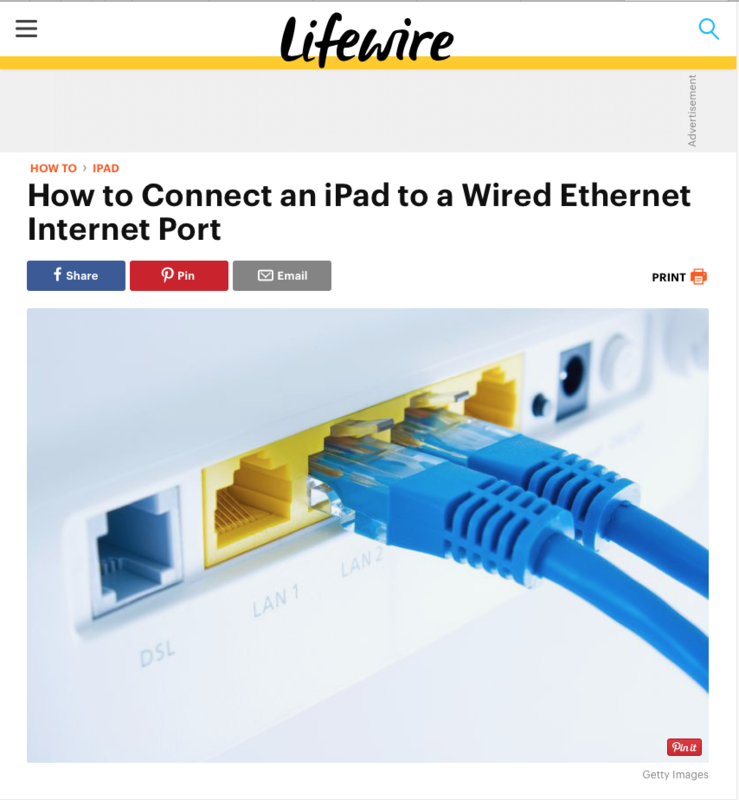 The iPad is designed to be a wireless device, and unfortunately, it does not have an Ethernet port for connecting directly to a router or network port. However, there are a few ways you can get around this and hook your iPad into an Ethernet network port or the back of your router. If you absolutely must go wired, you can use the Lightning to USB 3 adapter. Apple refers to this adapter as a “camera connection kit”, but it can connect any compatible USB device to the iPad. You can use this adapter to connect a wired keyboard, MIDI devices and, yes, USB-to-Ethernet cables. There are two big differences between the newer Lightning to USB 3 adapter and the old Camera Connection Kit. First, the newer adapter uses USB 3, which allows for much faster transfer speeds. Second, the adapter includes a Lightning port for the purpose of plugging into an electrical outlet. This allows you to charge your iPad while you use the adapter, and more importantly, it allows the adapter to supply power. This solution works best when using Apple’s USB to Ethernet adapter with model number MC704LL/A. There may be some issues using the older USB to Ethernet adapter or using third-party adapters, however, you may be able to use a workaround to get other cables to work properly. You should first hook the Lightning to USB 3 adapter into your iPad. Next, plug the adapter into a wall outlet using the Lightning Outlet Adapter that came with your iPad. After you have supplied power, hook the USB to Ethernet adapter into the USB 3 adapter and then connect it to the network using an Ethernet cable. Remember when we mentioned a workaround? The main problem getting the iPad hooked into Ethernet is the need for power. The iPad will not supply power if it is running on battery power, so the new Lightning to USB 3 adapter helps solve that problem. But what if you have the old Lightning to USB adapter? Or what if your USB to Ethernet adapter doesn’t work well with the new Camera Connection Kit? The solution: add a powered USB port to the mix. It should be noted that this workaround can be a little wonky for lack of a better word. If everything is hooked up in the right order, it should work, but because this process involves doing something the iPad wasn’t designed to do, it isn’t guaranteed to always work. You will need a powered USB hub in addition to the USB Camera Connection Kit and the USB to Ethernet adapter. Once you have everything, connecting your iPad is relatively simple. Before you start, turn off Wi-Fi for good measure. You will also need to make sure the USB hub is plugged into a wall outlet. Again, the process will not work without the hub supplying power. First, hook the Lightning-to-USB connection kit to the iPad. (If you have an older iPad with the 30-pin connector, you will need the 30-pin USB adapter.) Next, connect the iPad to the USB port using a USB cable. Attach a USB-to-Ethernet adapter to the USB Port, and then connect the Ethernet adapter to a router or network port using an Ethernet cable. If you experience any problems, try rebooting the iPad and going through the steps again.